Maryland Pink and Green: Crepes! This recipe comes to me from my friend Dragana. I've made crepes using many different recipes, but this one has been the best. These turn out perfectly every time and are so light and delicious. 1. Mix eggs, flour, sugar, and liquid using the blender. 2. Add a pinch of salt and some oil. It should be very smooth, and not as thick as pancakes. 3. Let the mixture sit for 5 minutes. This is important! 4. Fry in a non-stick pan using cooking spray. 5. Flip in the air, or flip the crepes using a spatula. 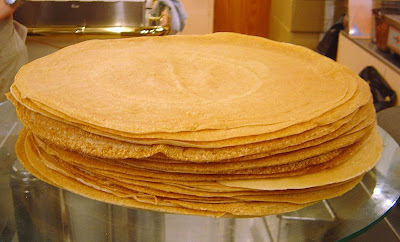 These crepes will flip perfectly in the air if they are cooked properly. I only use a few tablespoons and carefully spread out in the pan by swirling in a circular motion as soon as it is in the pan. 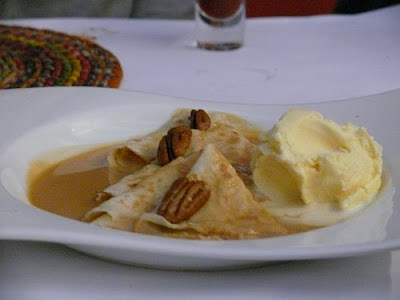 My favorite crepes are made with cajeta (a type of caramel) with nuts. If I don't have cajeta, I love to eat crepes with Nutella. So good! 1. Cajeta with nuts. Seriously, you simply must try cajeta. It is so smooth and delicious. P.S. 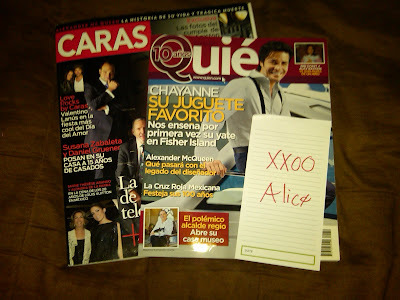 Mil gracias to my dear friend Alice at Summer is a Verb for sending me a lovely dose of Mexican society magazines. I made the children crepes for breakfast on Tuesday - love them! The new issue of Martha Stewart Living has a Meyer lemon and crepe cake that looks divine. My absolute favorite food ever! I MUST try this recipe. Nutella and banana crepes make my heart go pitter patter! wow girlie!! those look PERFECT! Yum! I feel in love with Crepes when in Paris in college, always with Nutella and Banana. Just the thought of crepes makes my heart skip a beat! I'm hungry now! NUTELLA CREPES = HEAVEN. I was just discussing with my husband that I was looking for a crepe recipe. I was floored when I saw this post today. I can't wait to try this recipe. I'll let you know how they turn out. Nice blog you have here, will stick around for awhile. These look great, my daughter has been wanting me to make crepes since she is taking french this year. Coming over for Friday Follow! I found your nice family blog on Friday Follow. I’m following you now on Google Friends Connect, and would appreciate a follow-back. My blog is on inspirational themes like family, faith and kindness. Brie cheese and strawberries - my favorite crepe. Yours look perfect and delicious!